The huge long standing experience and the good knowledge within your trade enables our consultants to find perfect candidates within a short period of time. The peculiarity of this unique network or business group is that we search exclusively. Headhunters as members, who are former or active top managers, some with management experience in international companies and groups. We are looking forward to working with you as soon as possible. 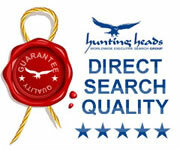 Each of our headhunters has a life experience of at least 45 years. To assist the Head Hunters we have a build a team of more than 100 high level recruiters all over the world to establish our Know How Management. The research market knowledge and the established networks are enabling out consultants to use the complete hunting heads knowledge at all times. We use our internal instruments to secure the quality of our work.